When it comes advergaming, for the most part, is some slapdash game that's vaguely related to the product its designed to sell. There have been a few exceptions to that rule -- namely the Burger King mini-games that were released for Microsoft's Xbox 360 a few years ago. Then there are games like Love Shot, a goofy advergame for the new Jennifer Lopez film, 'The Back-Up Plan.' Love Shot borrows from classic arcade game Galaga, but instead of shooting advancing aliens with lasers, you shoot down 'life's obstacles,' e.g. a career, education, bills and Mr. Wrong ... with heart-shaped sperm. Yup, you read that right, you shoot life's obstacles with sperm. Wha? 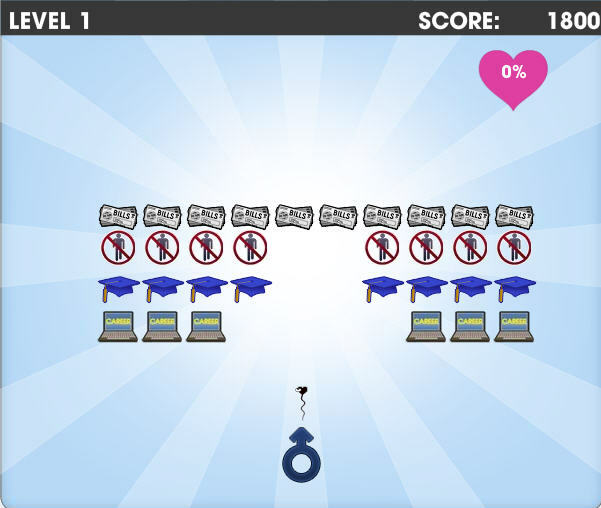 Once you've eliminated the obstacles, the goal is to shoot the heart at the top of the screen (with more sperm) until it reaches 100%. The round ends and then the next begins, which is pretty much the same thing all over again. We're all for creative advertising, but if you're going to do it in the form of a game, it -- at the very least -- should have a little more quality control. Games, by their nature, should be entertaining. Now, not only do we not want to play Love Shot, but also put the Back-Up Plan firmly atop our 'don't see' movie list this spring.